It probably goes without saying that the best way to learn how to play crosswords well -- by which I mean finishing at all, finishing with no mistakes, and finishing fast -- is to play them. One source of information about playing crosswords well is at my list of rules for the puzzle. But if you also want to benefit from my experience and that of people I've played crosswords with, here are some tips you can use to increase your enjoyment when playing internet casino games just isn't enough. Update of April 8, 2001: An article by Will Shortz, the editor of the NYT crossword, appeared in today's edition of that paper, titled "How To Solve the New York Times Crossword Puzzle." You should certainly read THAT too. A. Don't write too soon. Don't write in an answer, or even a single character, until you're pretty darned sure it's right. If you persist in filling in the first correct-length answer that pops into your head, you're certain to get too many wrong and make your work in the perpendicular direction a lot harder. This is a rookie mistake. Instead, train yourself, whether on purpose or by slow accretion, to memorize that potentially correct answer and where it goes. If you can do that, you can look at the intersecting clues to see whether they fit with the answer that's written in your head but not yet on the page (about which a bit more later*). B. Keep an open mind. It is essential, especially in the harder puzzles, that you keep your mind open to all possible meanings of a clue. So many words in English have more than one meaning and can even take more than one part of speech that if you inadvertently get locked into one meaning or one part of speech before you've let your mind wander around the possibilities, you're sure to waste time and frustrate yourself. Here's a pathetic but true example I remember over and over again: The clue was the single word "Rear," and I got it in my head that the word was an adjective or a noun referring to the back of something. I struggled with that area of the grid not for several seconds but rather for a couple of minutes before I finally realized "rear" could mean "raise," as in "rear a child." As I look back on it now I can see that I was being really dense not to open up my mind to other possible meanings, but somehow I got myself into a wrong rut and didn't realize it. If someone had just tapped me on the shoulder and said, "What are the possible meanings of 'rear'?" I would have gotten the answer right away. My advice for when you get stuck is to reach around and tap yourself on the shoulder. It's not always easy to keep your mind open to all the possibilities, but if you remember to look at it from the viewpoint of the puzzle's author you will find it easier. Especially in the harder puzzles -- the ones towards the end of the week for the NY Times -- constantly reminding yourself not to get married to a particular meaning of a clue or answer will pay off. It's more satisfying if you can get the answer without having to fill in all the crossers. The worst clue. The ultimate example of a word that can have many meanings is "set," which sets the record by occupying approximately 23 pages in the Oxford English Dictionary, which is roughly 60,000 words, or 326,000 characters, explaining 430 definitions. No doubt you cannot dredge up all three dozen dozen definitions, but if you stop for a moment to count up the ones you can think of off the top of your head, I'll bet you can come up with one dozen before you get bored. Still, if you see the word "Set" as the clue, good luck. In case you're interested, the runner-up is "run" with a paltry 165 definitions. C. Erase. Don't hesitate to re-examine answers you've written in. If an area of the grid seems particularly vexing even though the clues seem simple, your first reaction should be to take a moment to check the letters you've already filled in, and maybe erase some of them. Said another way -- and this can't be said too often -- don't believe everything you read, er, write. D. Which clue next? Once you've gotten started on a puzzle, the useful question "Which clue should I read next?" is one that frequently presents itself, whether you realize it or not. If you do realize it, you can make wise choices about which clue to try next. Here's a surprisingly large number of tips to help you be wise. 1. Look at the grid to see which clue to read next, as opposed to reading a clue and then looking at the grid to see where it goes. 2. Short answers are usually easier than long ones. Duh. 3. In any virginal area of the grid, go first for the answers in the topmost row (as opposed to any row below the top) and the leftmost column (as opposed to any column to the right of that). The first letter of an answer is almost always the most useful, especially if you want to look it up in a reference work, and it's the top row and left column, of course, that contain the initial letters of the answers in the perpendicular direction. 4. It is neither necessary nor desirable to look at each clue in strict numerical order. As soon as you get your first answer, don't hesitate to switch to the clues for the answers that intersect the answer you've already got. Don't worry about missing some clues altogether once you've passed them up the first time, because you will automatically eventually look at every clue you need to no matter what. 5. If you've got two parallel answers in an isolated area of the grid, go next for those answers that intersect both those answers as opposed to those that intersect only one. If it's not obvious why this is good advice, read it again and think it through. 6. As you're scanning through the letters of an answer you've filled in to see which answers you can get in the perpendicular direction, start with the least commonly used letter. For example, if you've entered EQUATE in an Across answer and you want to examine the clues to the six Down answers that intersect it, you should start with the second clue, the one that has a Q in it, and then move on to the third clue, the one with a U in it, and so on till you get to E.
The most frequently used letters in English (often said to be, in order, "etaoin shrdlu") appear, almost pretty much by definition, more often in crossword answers than the least commonly used letters. However, those most commonly used letters are not the same letters that appear most commonly as the first letter in all the words in a dictionary. For example, the most commonly used letter is E, but relatively few words start with E.
The letter E is the most popular in crossword answers, as it is in words at large. In the Rhu2 the letter E begins only 3.07% of the words defined, whereas if we merely divide 1 by 26 we get 3.85%, a difference of about 20% right there. When we account for the fact E is the most commonly used letter in any position, the difference rises easily to twice that. The point I've been blathering towards is that words that start with E will appear in crossword answers out of proportion to the number of words that start with E in the dictionary. Now that I think about it, I'm not sure how this factoid helps you as a cruciverbalist much, unless you decide you're going to sit down and start memorizing dictionaries, in which case you should definitely start with E. Also, now that I think about it, I have never actually counted up the answers that start with E to see whether they do appear more frequently than random chance would dictate; I just assume it must be true from performing this thought experiment. If you have a different take on this, . 7. If you're playing a fairly easy puzzle, and especially if you've followed the advice above, try reading and memorizing the clues to two adjacent answers at the same time (the Down clues are usually better for this). If you can see that the answer to the first one is correct, go ahead and check the adjacent clue to see whether you're just as sure about it. If you are, you don't have to waste time tracking down that second clue after you've written in the first one's answer. You can just read once, look down, then write once and be done, as opposed to reading once, looking down, writing once, looking up, reading again, looking down again, and writing again. 8. It's better to concentrate your efforts in a small area rather than just choosing clues at random. By staying in the same area for a while (just how long is a judgment call you must frequently make), you will find it easier to memorize the clues in that area, so that after you've looked at the clue for 15-Down a couple times, next time you look at the grid at 15-Down, you'll know the clue without having to find it again and read it again. If you bounce around, that ultra-short-term memory is more likely to evanesce. Obviously your memory is of critical importance in playing crosswords. If you literally cannot remember learning a particular relationship from the last time you tried to figure it out, you're going to have problems with crosswords. Recently I spent a while over a period of a week or so trying to check how long I spend looking at a clue before moving on to the next one (assuming I either have no idea what the answer is or that there are too many choices). It surprised even me to discover I spend less than two seconds from the time I start reading the clue to the time I start reading the next one. Let me say that another way. Here's part of what I do in those two seconds: I read and register the clue, I look down and re-find the proper area of the grid, I look back to the clues and find the next one, and I begin reading it; and whatever time is left out of those two seconds is how long I spend actually deciding I don't know the answer and that it's time to move on. I don't know for sure that you should spend so little time on clues that seem utterly baffling in the first second or so. I just know that's what I do, and, as I say, I didn't realize how little time I spent on such clues until I started checking myself. I also know that when I play crosswords with someone else, those partners who are intermediate in experience spend longer lingering over clues than I do, and that the novices linger longer still. I've never played with any sincerely advanced players so I don't know how long they spend on such clues. I do know that laying in bed playing crosswords with a partner of any skill level on a lazy Sunday morning is better than watching TV, even golf. E. Don't linger. Do not linger over a clue unless you're pretty sure you're about to get it if you just give it a few more moments of thought. Said another way, if you're striving to break the grip of the tip-of-the-tongue phenomenon then keep at it, but if you just plumb-bang have no clue, then move on immediately to a clue about which you do have a clue. When you've filled in some letters from intersecting answers or merely allowed your subconscious to mull it over for a while, then you can go back. F. Tip-of-the-tongue. With regard to that always intriguing and sometimes frustrating tip-of-the-tongue phenomenon, here's a trick that might work in getting your brain to dislodge that little factoid from your memory. Instead of trying to think about the answer itself, try what one author on the subject calls "sideways thinking." What that means is that instead of focusing directly on the answer itself, you focus on something closely related to it, or slightly off to the side of it. To take a perhaps too literal example, if the clue is "Former name of Myanmar," and you know it's one of those countries near Viet Nam but you can't remember which one, try shifting your focus slightly away from the term "Myanmar" and instead move it sideways to your recollection of maps of the area you've seen. Look at the other countries and let Burma appear in your peripheral "vision." G. Go away and come back. As with other extended, focused mental exertions, sometimes the best thing you can do to finish a crossword puzzle is go away and come back. If you've beavered away for one or five minutes on a particularly stubborn area of a puzzle, just stop playing for a few hours or a few days and return to it at your leisure. I can guarantee that half the time, all of a sudden you'll get at least one of those answers that had vexed you earlier. You'll think to yourself, "Cripes. Yesterday I must have spent a full minute on that one clue and I couldn't get it and had to give up. Now, this morning I look at it again and get it in one second. Why?" As I see it -- and I'm just philosophizing here because I have no research to back me up -- what happens is that after a while of concentrating on a particular subject, your brain will continue to work on it even after you think you've forgotten about it. It's as though a subroutine in your brain gets launched after you thought you'd quit the program. Acting below the conscious level but still trying to be helpful, this subroutine silently rummages around in your neurons till it finds what it's looking for and then waits patiently, sometimes for months, to register it next time you need it. I will give you a dollar if you can explain to me how my neurons -- which are, after all, just carbon-based tissues made of human brain-meat -- can register and retain my memories. How can my brain-meat remember my fifth birthday party or that Lincoln was assassinated in 1864? How did Einstein's brain-meat concoct the theory of relativity? His ONLY tool -- and this is true for all of us all the time -- was a gooky mass of tissue inside his cranium that, if properly cooked, could be enjoyed as an ingredient in a scrambled eggs dish. How can meat remember? Better yet, how can meat think? Make it two dollars. While I think scads of people have experienced the invisible memory subroutine phenomenon, as far as I can tell not as many people have experienced a similar phenomenon with regard to dreams. What I'm talking about is the ability to dream about a subject of one's choosing. I mean the ability to give yourself instructions, while you're in your conscious mind, that will be carried out later by the invisible subroutine within your non-conscious, sleeping mind. Years ago I discovered that if I am engrossed in a subject for a fairly long time just before I go to sleep, sometimes I dream about that subject. For example, I remember playing a 2-D, monochrome version of a Doom-like game on a CP\M computer for two hours one evening with a friend (Hi, KJ). It was riveting for both of us to the point that we were literally shaking and sweating. That night I dreamt that I was the actual character in the game, darting from place to place and shooting the bad guys. Another time just before I went to sleep I had been playing a crossword, and that night I dreamt I was playing a crossword. The only thing in my dream's field of view was the clues and the answer grid, and in my dream my attention went back and forth between the two as though I really were playing, which I suppose I was. Choosing a subject to dream about doesn't have to be accidental. I've known since my mid-twenties that I can control what I'll dream about. When I decide to do so, I start by telling myself, as I'm settling into my pillows, that this is one of those nights when I want my dreams to be about what I want them to be about. Then I simply begin thinking about that subject until I drift off to sleep. I think about it languorously but exclusively. Intermittently I try gently to remind myself that this is a good thing to dream about. When I recognize that I'm in the hypnagogic state I try to remember that when I do start dreaming, this is the subject I want to dream about. With regard to that hypnagogic state, I've found it useful to be able to recognize it (and its counterpart, the hypnopompic state). Whenever I can manage to recognize that I'm in in that eerie state between waking and sleep, I strive to make use of it by focusing on a pleasant subject in the hope that I'll dream about it. I won't reveal which subject attracts my attention most of the time, but I will tell you it isn't crossword puzzles. Which brings me to the subject of what's called a lucid dream. In the same way that we humans can recognize the hypnagogic state and implant an especially powerful suggestion to our brains to initiate a particular dream subroutine, so can we recognize the full-blown dream state itself and, on occasion, actively control the dream as though the brain were awake and conscious at the same time it's dreaming. Once you realize that you're dreaming (which is the definition of a lucid dream), you can do literally anything you like, without fear of any consequences. If you have never experienced this phenomenon, you really ought to give it a try. If you have experienced it, did you know you can try to promote its occurrence? If you have experienced it often enough to have the presence of mind to transmute the dream circumstances into anything you like, do you always switch to the same fantasy realm I do? Another phenomenon I think many people besides me have experienced is when you start paying too much attention to how a word sounds and lose track of what it means. Whether you're recreationally or otherwise brain-changed or not, some word or other will keep running around in your brain till the only characteristic you can apprehend about it is its sound. Banana. You don't realize till after you've heard its sound in your brain several times that you can no longer remember what it means. That's an interesting moment. For a second or two, or longer if you are able to extend it, you're completely unable to answer the question "What does banana mean?" Not only do you not know what the word means, you don't even realize it's a word. There's a name for this so you can Google it: Semantic Satiation. Surely many people have experienced these phenomena, and if you've read this far you might not only have experienced them but also recognized them and wondered about them. I wonder about them. As with so many other aspects of how the human brain does what it does, the storage and processing and retrieval of memories are fascinating to me, as I think they should be to anyone, considering how important memory is to human existence. 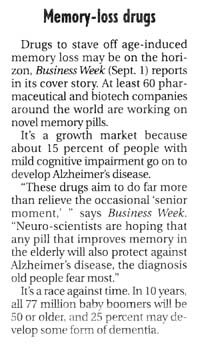 It is not outside the realm of possibility that we will someday invent a pill to improve memory. I wrote the paragraph above, if I remember right, sometime in 1999. Here's a news article from the September 2, 2003, edition of The Kansas City Star. 1. If a clue implies a plural answer, consider writing in an "s" at the end, especially if that same cell is the last letter of the intersecting answer whose clue also implies a plural (or a present tense verb; see #2 immediately below). Of course, it's possible that even if both answers are plurals neither of them ends in "s," but it's unlikely. If the probability of a plural ending in something other than "s" is 10%, then only once in every 100 such occurrences will both words not end in "s."
3. If a clue implies a past tense verb, the same advice applies as in the two tips above, except that you'd consider writing in "ed" instead of "s." For example, if the clue is "Walked" you can be pretty sure the answer is something such as TRAIPSED, but note that it could well be STRODE or TROD. 4. If a clue implies an actor, i.e, one that acts, whether animal or not, the same advice applies as in the three tips above, except that you'd consider writing in ER or OR. For example, if the clue is "One who goes on foot" you can be pretty sure the answer is something such as WALKER or PERAMBULATOR or some other term that ends in "er" or "or," but note that it could be MAILMAN (or, to be more out loud politically correct, PERSONPERSON). 5. If the clue implies a superlative, the same advice applies as in the four tips above, except that you'd consider writing in EST. For example, if the clue is "Most capable" you can be pretty sure the answer is something such as ABLEST, and if the clue is "Least dry" you can be pretty sure the answer is something such as WETTEST. There are exceptions, those being words that are superlative to begin with. For example, one answer to the clue "Least numerous" is NONE, and for another example, one answer to the clue "Most unusual" is UNIQUE. 6. Similarly, if the clue implies a comparison, the same advice applies as in the five tips above except that you'd consider writing in ER. For example, if the clue is "More capable" you can be pretty sure the answer is something such as ABLER, and if the clue is "Less dry" you can be pretty sure the answer is something such as WETTER. Tip: The most frequent letter to precede the ER in such answers is I. You can also guess at beginning letters, of course, such as NON- and UN- and the popular RE-. If the clue implies something happening again ("Second airing" = RERUN, "Tape again" = RERECORD), it probably starts with RE. I. U follows Q. This is an easy one: "U" almost always follows "Q." Even in Spanish and French and Italian, but not in Arabic. Some crossword constructors have their own list of words with a Q that is not followed by U -- words such as Q-TIP and IRAQ -- because that list frees them up to use Q more often. Update of September 11, 2002: If you're wondering whether Al-Qaida (or Osama Bin Laden or Taliban) will show up in the New York Times crossword puzzle, the answer is yes, maybe, but probably not soon. Even the use of "Twin Towers" is a current subject of debate among some constructors. OMAR is usually clued with respect to U.S. Army General Omar Bradley (after whom the famous Bradley Fighting Vehicle is named) or the actor Omar Epps, and sometimes Omar the Tentmaker. You can read a little more about Omar the Nutbar here and here. 1. In the simplest way, they're the answer to a fill-in-the-blank clue such as "Anne's husband Henry the ____ " (answer: XIII) or "Superbowl ____ : San Diego v. San Francisco" (answer: XXIX). 2. In the second simplest way, they're used in a straightforward math problem. For example, the answer to the clue "DXII doubled" is MXXIV. You merely translate the number in the clue into an Arabic number, do the math (in this case, multiply it by 2), and translate that answer back into Roman numerals. The "discovery" of the number zero, by a Hindu who lived no later than the ninth century, was one of the most significant in human evolution. It was inevitable, but that doesn't make it any less noteworthy. Roman numerals were better than nothing, but the lack of a zero was a fatal flaw. 3. The third way in which Roman numerals are used can be the toughest test of your willingness to struggle with them. Here's a really difficult example clue: "Year in the reign of Clement." To start at the beginning, St. Clement of Rome reigned from the year 88 to the year 97, which means that if he's the pope in question the answers could be LXXXVIII, LXXXIX, XC, XCI, XCII, XCIII, XCIV, XCV, XCVI, or XCVII. To end at the end, Pope Clement XIV sat in the big chair from 1769 to 1774, which means that if he's the pope in question the answers could be MDCCLXIX, MDCCLXX, MDCCLXXI, MDCCLXXII, MDCCLXXIII, or MDCCLXXIV. The best way I've found in this situation is to narrow down the possible answers, and the possible popes, by a process of elimination. For example, if the answer is shorter than seven characters long, you know it can't be Clement XIV. If you know the first character is a "D" or an "M," and if you know your Roman numerals, you know it can't be St. Clement of Rome. It can be tedious if you really try to go at it head on, so I suggest trying to fill in some of the answers in the perpendicular direction first and letting the full answer more or less work itself out on its own. The only characters I've seen used are M (1,000), D (500), C (100), L (50), X (10), V (5), and I (1). Incidentally, on a tangential topic, here's a bar bet. Ask the victim whether he thinks he knows all the Roman numerals on a clock. Then make this wager: "I'll bet you one beer you can't tell me the Roman numeral designations for any three of the twelve numbers on a clock, and I get to pick the numbers." When he agrees, you say, "Eight," and he'll say, "V-I-I-I." You say, "Nine," and he'll pause a moment and say, "I-X." You say, "Four," and he'll pause a shorter moment and say, "IV." Then you point out any proper timepiece with Roman numerals and you'll find that the number four is rendered, for some reason, as "IIII." K. Marking up the page. I gradually and unintentionally developed a simple yet comprehensive system of marking up the page that seems to work for me. Part of the system is to let me see at a glance, after I've finished the puzzle, what it is I'm still interested in before I throw it away. The rest of it helps me play better and faster. If you want to learn more about how to mark up the page, you may take a detour and then return here. L. Clues ending in "Var." A thankfully few number of clues in NY Times crosswords end with the designation "Var.," as in "Eskimo home: Var." "Var." is an abbreviation for "Variant," meaning a variant spelling. In this case the answer is IGLU. Sometimes the answer is a variant with which you are familiar, such as THRU for THROUGH or the benighted NITE for NIGHT, but other times it's not. Update of October, 2003: Back in 1998 I bought a fine used car from Olathe Ford, a major dealership in the area. 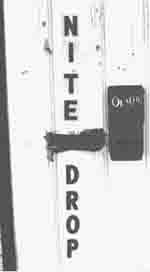 This is the sign next to the door of their body shop, and it hasn't changed since then. In any case, you can't really be sure of the answer to one of these dreaded "Var." clues till you've filled in the intersecting answers. M. Cute Clues. Some clues are particulary worthwhile because they are cute. "Army threats?" = OCTOPI. "Came to a fast stop" = ATE. "Fish market sights" = SCALES. These clue-and-answer relationships require you to break out of the usual "A equals B" mindset. They play with language. They present you with wordplay that is satisfying to discover. There's an Aha! moment when the connection crystallizes. Twain's Tom Sawyer is high verbal art, but it's over 250 pages. O. Henry's short stories are high verbal art, but they run to dozens of pages. Dave Barry's humor columns are high verbal art, but they're still hundreds of words long. A crossword Cute Clue is high verbal art of the most compact form possible. Some of the Cute Clues end in a question mark, which should alert you to the likelihood there's something literally funny or a bit askew going on. (I wish none of them ended with a question mark, because the satisfaction of getting the answer -- that Aha! moment -- is heightened if you aren't expecting it.) Cute Clues are one of the main reasons I keep playing crosswords after so many years. It must be noted that my choices for this list are entirely subjective. You might find some of them to be banal, and you might wonder how I could have missed your ten most favorites. It should also be noted that Will Shortz, the editor, often rewrites clues and sometimes answers, so he deserves credit for some of these Cute Clues, and I'm sure that's true of the other high-quality crossword editors. Update of June 2010: Just so you'll know, I still have not stopped collecting Cute Clues, and I don't intend to. I just still haven't updated the list, but I will someday soon. N. Unlikely letter combinations. When you're considering an answer that crosses letters you're already sure of, check to see whether that answer produces an unlikely pair of consecutive letters. For example, not many answers will have the letter combinations JK or KV or VX. Combinations of unlikely letters of three characters such as IJK and JKL and KLM are even more unlikely. The best way to know which combinations are unlikely is to know how words in English are typically spelled and pronounced. It seems to me that English must be an extraordinarily difficult language to learn because of the spelling variations alone. I remember from when I was a kid something about how G-H-O-T-I spells "fish": You take the GH from "tough," the O from "women," and the TI from "motion." QED. As another example, consider from the viewpoint of someone trying to learn English as a second language the word "bow." It can be any of several verbs, and it can be any of several nouns, and it can be any of several adjectives. It can be pronounced to rhyme with cow or it can be pronounced to rhyme with sew. And it can be spelled bough. In contrast, in Spanish, por exemplo, if you know what the letters of a word are, you know how to pronounce it; and if you know how to pronounce a word, you know how to spell it. What a deal. Same with Hawaiian. Or consider how we native speakers of English almost always agree on the particular order of a series of adjectives. For example, if you want to modify the word "ball" by the adjectives "red" and "big," you would never think to say, "the red, big ball." It's always "the big, red ball," isn't it? But why? And now that I think about it more, maybe whatever the reason is applies to other languages as well. If English is not your native language and you understand what I'm asking, please whether you would say, "the red, big ball"? The answer is short enough that it's probably a single word. If the answer has enough letters, it might be a multiple-word answer, in which case the suspect combination could be the last letter of one word plus the first letter of the next, e.g., MILK VETCH. The answer is not an abbreviation. If you have reason to believe the answer is abbreviated then almost any combination can appear, e.g., JFK. The combination occurs at the beginning or the end of the word. Beginning. Certain combinations can be ruled out if they appear at the beginning of a word, even if they are otherwise common. For example, the letter combination RT appears in thousands of words, but no word begins with RT. End. Similarly, certain combinations can be ruled out if they appear at the end of a word, even if they are otherwise common. For example, the letter combination PL appears in thousands of words, but no word ends in PL. The answer is not a foreign word or a proper noun. In the same way that abbreviations allow for any otherwise unpronounceable combination of letters in English, so do foreign words and proper nouns, such as Tblisi. O. Unconscious counter. As you play crosswords more, you will get better at counting answer cells without really counting, which means you can immediately reject all the answers of the wrong length. What I mean is, when you read a clue and come up with a potential answer, you will be able to see whether the length of that answer fits the grid without actually ticking off the individual squares in your head. Your peripheral vision and your brain just kind of sense how long it is. That's good, because counting is time-consuming, so you should learn to develop and then, as it's appropriate, begin to trust your unconscious counter. Some of the advice above has come from reminders made by readers of this page, so thanks go to them. If you have any suggestions for how I should expand (or shrink) or otherwise improve this section on how to play crosswords well, please . L. Clues ending in "Var."